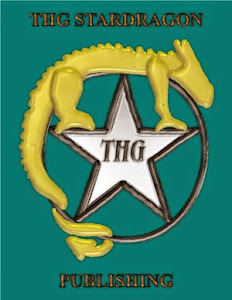 Thank you to independent author and artist Marantha D Janelle (Homeward Bound, The Ihmayran Chronicles) for taking the time to do an update for the THG StarDragon Publishing logo. I will work on using the new logo at the various locations when I have the time to update pages, and get the image to the host of the main publisher site. This is at the size that most of the sites have it at. So this will also be on future book covers as well. The calendars look great. They feature a very nice shot of the engine and the mountain. This one is the first one that I was able to afford an ad on, and it looks good as well, and the price of the ad goes to helping support our firefighters so they can keep responding to fires, medical emergencies, and digging little old ladies out of the snow after a blizzard. In Selkies' Skins, we rejoin Etain for her part of the story. She finds yet another duty to tend to before she can even think of continuing on her way home, after talking with a very iritated Triton. What does she find, and what has she gotten into now? It has taken a while to get the book over there, but Dragon Shaman book two is finally available on Amazon. The paperback version is even cheaper on there, considerably. It is also available on Smashwords, and still available through Lulu. Due to Lulu's higher costs, books through that print facility will still retain their higher price, so I suggest purchasing your copy on Amazon (either paperback or Kindle) or Smashwords (several ebook formats). The second edition of Dragon Shaman: Book One Taming the Blowing Wind is also currently available at Smashwords. Right now that has a version of the original cover. When Victoria Davis is finished with the recover, I will upload the new cover, and those that purchase it now on Smashwords will then be able to have both the new and old covers. Something that I personally have noticed a connection between is the editing process and house cleaning. I don't know how many people have noticed this, so maybe, if you're one of those lucky people that don't have trouble with keeping things clear and spiffy, this won't apply to you. A big thing is clutter. Excess toys and knicknacks. Some people like this and won't feel comfortable if the room they are in isn't filled with these things. Other people detest them and get nervous if there are more than a few. So it is a matter of personal taste, unless it's at a level where one can't even move. Now, these can equate to points, plots, and subpoints in your story For example, I get bored if a story is too simple. Children's books usually need to be, unless you're writing for older children... advanced kids will be picking up advanced books early. So when I'm reading for personal pleasure, I want something intricate, full of plot turns, and if there are plot holes, I like to see those apparent holes get filled in later on in ways that make me go "Holey Moley, that is AWESOME, well played." You want enough to keep things interesting, but if you're going to have tons, then it is a good idea to pare down or make separate books. You want a good flow and a good challenge. Also, how well these are handled is important as well. Then you've got your typos and the little grammar problems, such as there, their, and they're. These are important, and nothing looks worse (at least to me) than misusing a word. There are lots of people with spelling problems. That is what the proofing process is for. If you are a terrible speller or know you confuse those (and even if not) then once you finish and have proofread and edited your own work, have someone else look at it that you know IS good with these, several when possible. This is why every title submitted to me is required to go through editing with either myself or Faith (often, both, though the time-fee stays the same unless it's an intensive revision/proof). Those things are like the dust that slip through the cracks and the dustbunnies under the couch. They are everywhere, but need to be looked for. Our brains have auto correct, and an author isn't going to catch them all. So what makes for an easier to follow book? If something has to be moved from kitchen to living room, do so. If you've got this great subplot, use it by all means, but if it would work better in another spot, try rewriting that section. This applies for not just your stories, but if you are a college or university student writing papers every two weeks (or spaced out more if you're lucky), do not be afraid to revise. If I were to put all the essays that I have written for university to date into one project folder, I'd have enough to write a textbook of my own in Asian Studies. Granted, even with most of them receiving A grades, they are not perfect and could still stand some revision. Finally, one more similarity between housecleaning and editing. Most people don't like to do it. But it is necessary to make things look their best. Thank you for listening to today's post. I encourage conversation, so if there is anything you would like to add, or something you'd like to debate a bit, feel free to comment. Chapter 13: Out in the Storm from the free to read web serial novel "Selkies' Skins" is now live on LiveJournal, Dreamwidth, and the serial stories site. Join Kirsty Makay as she balances her school life, friends, and special training for her role as a waterwitch and future priestess of the waters and life under Mara and the mysterious Lady of the Well. In this episode, she must steal her way out to care for David during his transformation. Will she make it to the sanctuary? Or will something go awry? If you like the story, don't forget to send a tip (if you can) or cast a vote for it at top web fiction, via the vote link at the bottom of the installment. There are also other works from other authors on the web fiction guide. or navigate the story via chapter listing. Today has been a busy day. In addition to having migrated both of Steven Disney's books to Smashwords for distribution (to make for more formats for our readers, not just the main two in ebooks), Elizabeth Buckley's work has also been migrated. Call of the Kami has been opened up for audiobook narration, and I am still working on getting Dragon Shaman: The Smoky Mirror over to ACX for audiobook production as well. Later on, Call of the Kami will also be migrated to the Smashwords distribution page. I am looking forward to getting back to working on the Selkies' Skins webserial and Dragon Shaman: The Forge and Well again though. Still looking for someone to record the audiobook version of Dragon Shaman: Taming the Blowing Wind. This is a good opportunity to start an at home career and get residual royalties for a long term income, and there are many other titles from other publishers and authors that are available at this creation site. Become part of our team! Follow the Link to audition for our first audiobook. Other titles will be opening too, eventually.